Fuchsia gartenmeister blooms almost all season long. Near the coast Fuchsia gartenmeister can be planted in full sun, but in inland gardens it is best to find a shady location in the garden. 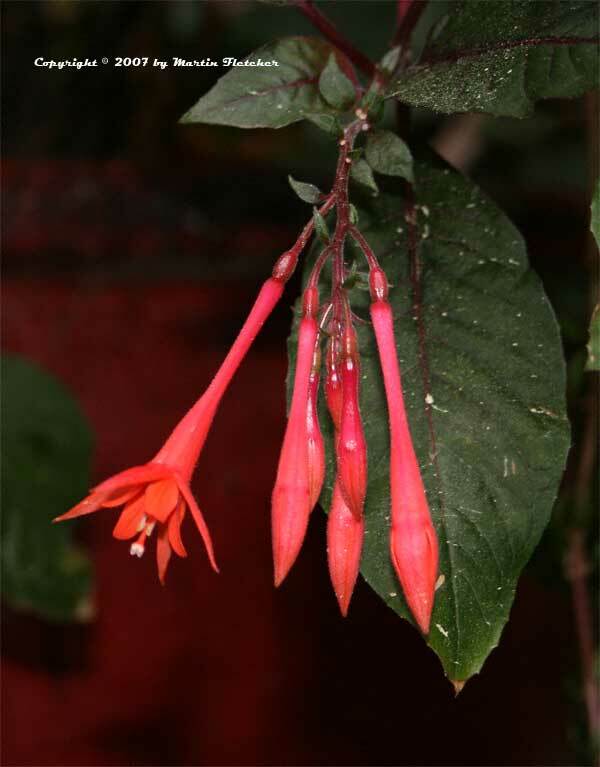 Fuchsia gartenmeister prefers regular moisture and requires reasonable drainage. I trim back the plants periodically to stimulate new growth, otherwise the plants can start to get leggy. If you trim one of the branches every few weeks Fuchsia gartenmeister can stay full and colorful. A frost free garden is preferred, but with some protection a light frost can be survived. Slender red flowers of Fuchsia gartenmeister Bonstedt. High resolution photos are part of our garden image collection.